ARES applications for the 2018 fall semester are due September 16, 2018 (MSU Bozeman applications are also due September 16, 2018, see bottom of the page) and applications for the 2019 spring semester are due December 21, 2018. A student must be a U.S. citizen enrolled as a full-time student at a Montana Space Grant Consortium campus. A student and faculty mentor work as a team on a project. The project should go beyond what is taught in the classroom and be an honest research experience (no bottle-washing or lab-sweeping). Funding is for compensation of a student's time, not supplies, on a research project. The student must complete an application form and write a 2-4 page proposal, including a project title, explanation of the problem to be studied and how that relates to NASA's mission, goals to be achieved, experimental approach, and references. Please include an estimate of how many hours you anticipate working on your project per week. The faculty mentor must write a supporting letter, describing how the student will contribute to the research project, and indicating support for the proposal. Student awards will be up to $900 per semester. The awards will be distributed through the MSU payroll system with monthly hours submitted by the students. A final report of at least 2 pages must be completed at the end of the term. Submit final report here. 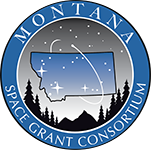 Since March 1999, the Montana Space Grant Consortium has made awards available to undergraduate students involved in research activities at smaller Montana campuses. Due to the success of the program at the other MSGC campuses, we are adding MSU-Bozeman, UM-Missoula, and Montana Tech funds to the pool for expanding ARES opportunities to those students starting this Fall. Visit our Members page for further contact information for individual campus Space Grant Representatives. If you are awarded ARES funding, you must complete the Responsible Conduct of Research (RCR) training course, HERE.